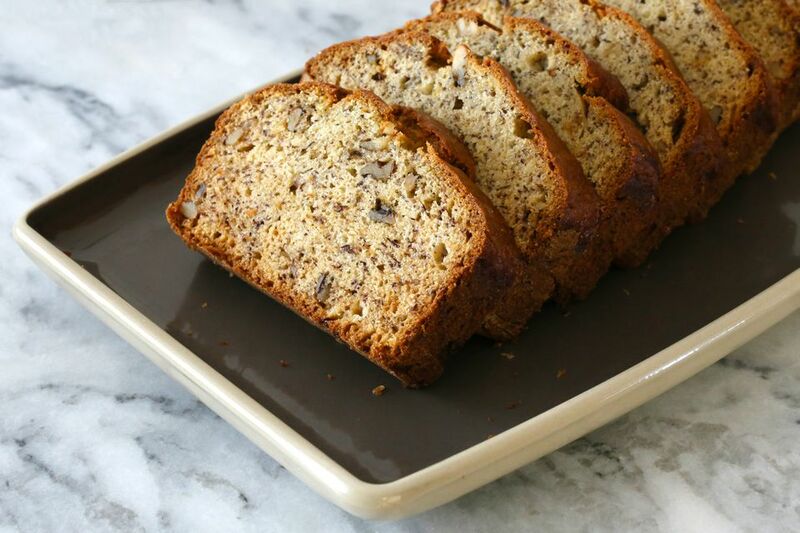 If you have three ripe bananas, you can bake this easy, delicious loaf of banana bread. Don't let the simple list of ingredients fool you—the flavors are well-balanced and the banana bread is wonderfully moist. If you're looking for a basic, delicious loaf for your friends, family, or a bake sale, look no further. This is the perfect loaf of banana bread. In fact, you may want to make two loaves and freeze one for another day. There are so many ways to make banana bread, including dairy-free and gluten-free loaves, recipes with chocolate chips, banana breads made with biscuit mix, and even peanut butter banana breads. Preheat the oven to 350 F. Grease and flour a 9 x 5 x 3-inch loaf pan. In a mixing bowl, combine the mashed bananas, butter, and beaten eggs. Whisk to blend thoroughly. In another bowl, combine the flour, sugar, salt, and baking soda. Stir to blend the dry ingredients. Stir the dry ingredients into the first mixture until blended. Add the chopped nuts. Pour the batter into the prepared loaf pan and bake in the preheated oven for 1 hour to 1 hour and 15 minutes, or until a wooden pick or cake tester inserted in center comes out clean. Enjoy the bread with flavored cream cheese or butter spread or plain butter. As with most quick breads, the dry ingredients should be mixed into the wet mixture gently. The leavening begins working as soon as the mixtures are combined, so make sure you have your oven preheated and pans ready before you combine them. Cold ingredients can slow rising and baking times. Bring eggs, milk, and other refrigerated ingredients to room temperature before you begin. Because oven temperatures can vary by several degrees, begin checking quick bread around 10 minutes before the end of the recipe baking time. Does the loaf seem to be browning too quickly? Tent the pan loosely with a sheet of foil. Bake quick breads in the center of the oven or on the middle rack. Always allow the bread to cool completely on a rack before cutting or wrapping it. If your bananas are underripe, there are a few ways to ripen them quickly. Place the unripe bananas in a paper bag with a ripe apple, pear, or tomato; stand at room temperature for 24 to 48 hours. Or, place the unpeeled bananas—yellow, not too green—on a baking sheet and bake them in a 300 F oven for about 15 to 20 minutes, or until the peels are dark. Basic Banana Bread With Chocolate Chips: In addition to (or to replace) the chopped nuts, add about 1/2 cup of mini or regular semisweet chocolate chips to the batter. Add 1/2 cup of raisins, chopped dates, or another chopped dried fruit to the banana bread batter. Spice it up with about 1/2 teaspoon of ground cinnamon and a dash of nutmeg.